Umbelliferae: Apium leaves an tiny inflorescences, Daucus habit, Foeniculum inflorescences, Eryngium inflorescences, Petroselinum root. 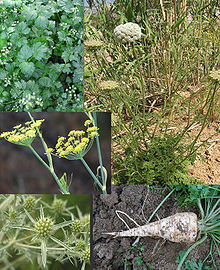 The Apiaceae (or Umbelliferae), commonly kent as the celery, carrot or parsley faimily, is a faimily o maistly aromatic plants wi holla stems. This page wis last eeditit on 24 Dizember 2015, at 09:36.